Rain-kissed wild black currant goodness. It’s wild booze month at Hunger & Thirst and again I have Butterpoweredbike to thank for motivating me to the computer to write something. That—and for getting me into the liquor cabinet for a night of distraction from my many winter obligations. Fortunately, Gregg and I were good little alcohol squirrels over the warmer months, storing wild foraged ingredients in bottles of booze now and again. One batch of our prized bathtub gin—made from vodka flavored with juniper “berries” and wild angelica—remains, but as of the other night there were also a few experiments yet to be tried: wild grape vodka, wild black currant vodka, and wild black currant brandy among them. Black currants abound around an old miner's cabin at high elevation above Fairplay, Colorado. We tested the currant vodka first. It is a stunning deep black-red-purple in color, a beautiful contrast to the recent whites of snows we’ve been getting in the high country. Gregg says the taste is similar to the black currant juice he drank every morning over breakfast while visiting Austria last winter. In fact, he is so obsessed with the stuff that any time we try anything flavored with the fruit—the vodka, brandy, and also some preserves I made—he gets to ruminating on how to obtain black currant juice in bulk. “For me to have a glass of it every day you’d have to make that your sole foraging pursuit,” he explains. “Let me get this straight: You wouldn’t even want any Boletus edulis?” I argue, since he prizes the wild porcini so. Inconspicuous ground cover shields the dark, delicious, dangling berries. Not to be confused with the sticky red currants or purple gooseberries that also abound in the Colorado high country, the currants I used to infuse the boozes four months ago were the big, shiny black berries of a low-lying spineless Ribes—what I think to be wild northern black currant (Ribes americanum) as described by Kershaw et. al. (1998) in Plants of the Rocky Mountains but not the same as the popular European variety (Ribes nigrum). We collected a bunch late in fall, handfuls at a time, on our hands and knees in the underbrush of a shaded mountainside valley next to the ruins of a miner’s cabin in high elevation Fairplay, Colorado. Europeans were among Colorado’s early miners, so at first I thought my find might be a cultivated variety, especially since the currants fruit so profusely in proximity to the dilapidated cabin. In Wild Edible Plants of Western North America (1970, 1975), however, Donald Kirk explains that “the various Ribes species are the alternate host to the White Pine Blister Rust, the most deadly fungus disease of Western White Pine, and other 5 needle pines…” For this reason, currant cultivation was widely banned throughout the United States’ early history, and even native species were targeted for eradication. 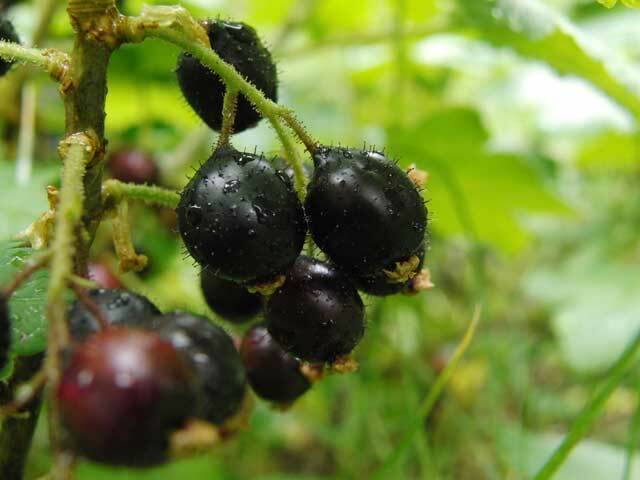 While black currant cultivation is beginning to catch on in places, restrictions on growing it remain to this day in a number of U.S. states. Wild black currant liqueur provides momentary respite despite the clear reminder of a 1:30 responsibility. Our black currant vodka was good straight up, but that’s not how we drink, so I mixed a basic cocktail with club soda and simple syrup. “Mmm,” Gregg said, calling it a “fruity drink” while acknowledging the strong and distinctive flavor of the currants. It’s too bad I only made a pint because we downed our drinks fast and then he helped himself to a second one, polishing off the batch in an evening. The next night I dipped into the black currant brandy. Now that’s the stuff with which my current currant dreams are flavored. A sucker for sweet liqueurs, I added a few tablespoons of simple syrup to a shot of the wild red-purple brandy and served it over crushed ice. What can I say? It is divinity in a glass. We voted it best in house, albeit based on a survey of only two residents. After that it was all I could do to rescue it from the boyfriend’s eager gaze, as I hope to share some with my parents come February. Shoving the brandy back in the closet, I opened a bottle of wild grape vodka in its stead and endeavored a similar creation—wild grape liqueur over crushed ice. It suffices, but it’s nothing to write the internet about—at least not compared to wild black currant brandy. Marshall, K. Anna. 1995. Ribes americanum. In: Fire Effects Information System, [Online]. USDA, Forest Service, Rocky Mountain Research Station, Fire Sciences Laboratory. Have you tried Ribena? It is a black current syrup that you mix with water to get the wonderful juice Gregg loved so much. My husband drank it growing up in England and is obsessed with it. I know there is an import place here in Sacramento that sells it but you could probably buy it online too. Oooh, cool! I know somebody who is going to be very excited. Thanks! Well because of our obsession we intend to get what is due to us.With this I can say that Wild Black Currant Brandy is the best as well as Ribena , right LenaLoo? And once you taste it you will cling to it.